271,301 people of a variety of religious denominations, races and social status’ died of disease and starvation (NOT 6 million Jews by intentional extermination policy). The Jewish Bolsheviks who occupied and “liberated” certain camps (namely Auschwitz), deliberately stopped food and medical supplies organised by the IRC, from reaching internees, causing more deaths. Divisions of the Reich funded and facilitated the establishment of Jewish communities with virtually independent autonomy. Germany continued to facilitate the immigration of European Jews to various foreign lands. Approximately more than 2.5 million Jews were not interned by the Reich and were enabled to live freely and independently in Europe, with various restrictions. Two of the most important surveys of the Jewish question in Europe during World War II, are David Irvings examination of the Russian archives after the wall came down. Irving published his findings in his book, ‘Hitler’s War’ and said not one word about gas chambers. When questioned about this omission he said that there was no reference to gas chambers in the archives and therefore he did not discuss the question of gas chambers. Irving was arrested in several countries for hate speech for his purportedly, scholarly omission. The International Red Cross published their analysis in a three volume ‘Report of the International Committee of the Red Cross on its Activities during the Second World War’ published in Geneva in 1948. This analysis expanded findings of two previous publications: ‘Sur L’activite’ du CICR en faveur des civils detencus dans les camps de concentration en Allemagne 1939-1945 (Geneva, 1946) and ‘Inter Arma Caritas: The Work of the ICRF during the Second World War’ (Geneva, 1947). 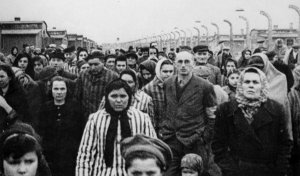 Regarding Theresienstadt, the Red Cross reported, “…where there were about 40,000 Jews deported from various countries, was a relatively privileged ghetto” (Vol. III, p. 75). “The Committee’s delegates were able to visit the camp at Theresienstadt (Terezin) which was used exclusively for Jews and was governed by special conditions … From information gathered by the Committee, this camp had been started as an experiment by certain leaders of the Reich … These men wished to give the Jews the means of setting up a communal life in a town under their own administration and possessing almost complete autonomy … two delegates were able to visit the camp on April 6, 1945. The ICRC also had praise for the regime of Ion Antonescu of Fascist Rumania where the Committee was able to extend special relief to 183,000 Rumanians, only up until the time of the Jewish Bolshevik occupation. The aid then ceased and the ICRC also complained bitterly that it never succeeded “in sending anything whatsoever to Russia” (Vol. II, p. 62). The same situation applied to other German camps after their coined “liberation” by the Bolsheviks. The ICRC received a voluminous flow of mail from Auschwitz until the period of the Jewish-Bolshevik occupation, when many of the internees were evacuated westward, many voluntarily leaving with German officials due to the encroaching Red Army. Unfortunately, the efforts of the Red Cross to send relief to internees remaining at Auschwitz under Bolshevik control were futile. However, food parcels continued to be sent to former Auschwitz inmates transferred west to such camps as Buchenwald and Oranienburg. One of the most important aspects of the Report by the ICRC, is that it clarifies the true cause of those deaths that undoubtedly occurred in the camps towards the end of the war. Itself alarmed by this situation, the German Government informed the ICRC on February 1, 1945… In March 1945, discussions between the President of the ICRC and General of the S.S. Kaltenbrunner gave even more decisive results. “Relief could henceforth be distributed by the ICRC and one delegate was authorised to stay in each camp.” (Vol. III, p.83). Clearly, the German authorities were at pains to relieve the dire situation as far as they were able to. Red Cross staff on routine monthly inspections of the camps, visit and meet with internees in the camp hospital wards – keeping with the Geneva Convention, which Germany was signatory to. The Red Cross are quite explicit in stating that food supplies ceased at this time due to the Allied bombing of German transportation, and in the interests of internees they had protested on March 15, 1944 against “the barbarous aerial warfare of the Allies” (Inter Armet Caritns, p. 78). The original 1946 edition did not even make mention of ‘extermination’ or ‘death camps’ but after the emotional impact of the Nuremberg trials and Western media hysteria, the Red Cross appeared “compelled” to introduce into the expanded 1948 Report several, very cursory references to ‘death camps’ (Vol. 1 p. 641). However, no means of ’extermination’ is indicated. In all its 1,650 pages, the three-volume Report does not ever mention such a thing as a ‘gas chamber’. It acknowledges that Jews and many other wartime nationalities, suffered rigours and privations, but its complete silence on the subject of ’gassing’ is ample refutation of the ‘Holocaust’ legend. This conflicts directly with the “thoroughness” of the purported “extermination programme” and with the claim in the forged Hoess memoirs that Eichmann was obsessed with seizing every single Jew he could lay his hands on. Those who remained in Slovakia seem to have been in comparative safety until the end of August 1944, when a rising against the German forces took place. While it is true that the law of May 15, 1942, had brought about the internment of several thousand Jews, these people, along with other nationalities, were held in camps where the conditions of food and lodging were tolerable, and where the internees were allowed to do paid work on terms almost equal to those of the free labour market” (Vol. I, p. 646). Not only did large numbers of the three million or so European Jews of conflict zones avoid internment altogether, but the emigration of Jews continued throughout the war, generally by way of Hungary, Rumania and Turkey. Ironically, post-war Jewish emigration from German-occupied territories was also facilitated by the Reich, as in the case of the Polish Jews who had migrated to French zone before the ‘German-French Armistice’ (the zone the west likes to refer to as “Occupied”). As future U.S. citizens, these Jews were held at the Vittel transitional camp in southern France for American aliens. The emigration of European Jews from Hungary in particular, proceeded during the war unhindered by the German authorities. “Until March 1944,” says the Red Cross Report, “Jews who had the privilege of visas for Palestine were free to leave Hungary” (Vol. 1, p. 648). Even after the replacement of the Horthy Government in 1944 (following its attempted armistice with the Soviet Union) with a government more dependent on German authority, the emigration of Jews continued. The Committee secured the pledges of both Britain and the United States “to give support by every means to the emigration of Jews from Hungary” and from the U.S. Government the ICRC received a message stating that “The Government of the United States… now specifically repeats its assurance that arrangements will be made by it for the care of all Jews who in the present circumstances are allowed to leave” (Vol. 1, p. 649). Besides the deaths caused by starvation due to the Allies “Barbarous Aerial Warfare” campaign of Europe, what is it that most of these 271,301 poor souls succumbed to? Let Dr. Charles Larson explain, who was one of America’s leading forensic pathologists, a Colonel assigned to the US Army’s Judge Advocate General’s Department. 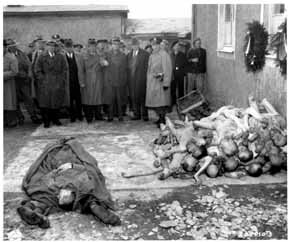 As part of a US War Crimes Investigation Team, Dr. Larson performed thousands of autopsies at some twenty German camps, examining on some days more than 100 corpses. What Dr. Larson did discover was, as the IRC discovered, that internees died of starvation and predominantly, TYPHUS, an old and terrible scourge of mankind that until recently flourished in places where populations were crowded together in circumstances where public health measures were unknown or had broken down. Such was the case in the overcrowded internment camps in Germany at wars end. Thousands of honest people disputing this claim have been viciously smeared as an hateful anti-Semite. Several countries around the world have jailed and heavily fined people for disputing the claim that “6 Million” Jews were killed by deliberate extermination policy. Provided here is a scanned image of an Official International Red Cross document, proving the so-called “Holocaust” narrative is a fabrication. Jews around the world have intentionally exaggerated and perpetually lied for the purpose of gaining political, emotional and financial advantages for themselves. They have committed willful, criminal FRAUD upon billions of trusting people around the world! Tax-payers of Germany, Switzerland, Austria, Latvia, Poland and many other nations have had multiple millions of dollars taken from their wages to be paid out to “holocaust survivors” and their descendants, for something that DID NOT HAPPEN. The tax-payers of the United States in particular, spend Billions each year in direct and indirect military support for the State of Israel [an illegitimate, illegal occupation according to hundreds of UN Resolutions – here] which was established through the false sympathy of this lie. This is intentional, criminal fraud on a scale so massive it is incomprehensible. The Red Cross death figures, of people from a variety of ethnicity’s and religious persuasions, combined in all camps, is precisely 271,301 – approximately half of which were Jewish. These unfortunate people died from, predominantly, Epidemic Typhus (better-known as ‘Camp Fever’ or ‘War Fever’) and starvation due to the Allies almost complete destruction of mid-western Europe, making the delivery of food and medical supplies, impossible.